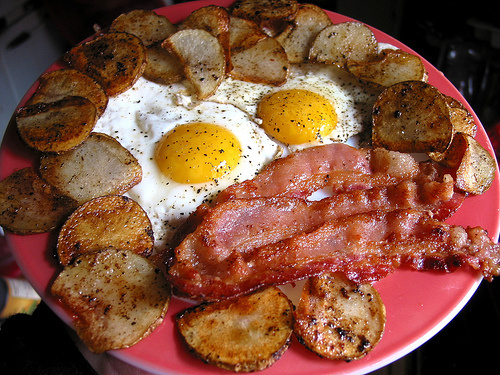 A ketogenic diet is based on animal fat sources. Ketosis is an often misunderstood subject. Its presence is thought to be equal to starvation or a warning sign of something going wrong in your metabolism. But nothing could be farther from the truth, except if you are an ill-treated type 1 diabetic person. Ketones – contrary to popular belief and myth – are a much needed and essential healing energy source in our cells that comes from the normal metabolism of fat. The entire body uses ketones in a more safe and effective way that the energy source coming from carbohydrates – sugar AKA glucose. Our bodies will produce ketones if we eat a diet devoid of carbs or a low carb diet (less than 60 grams of carbs per day). By eating a very low carb diet or no carbs at all (like a caveman) we become keto-adapted. In fact, what is known today as the ketogenic diet was the number one treatment for epilepsy until Big Pharma arrived with its dangerous cocktails of anti-epileptic drugs. It took several decades before we heard again about this diet, thanks in part to a parent who demanded it for his 20-month-old boy with severe seizures. The boy’s father had to find out about the ketogenic diet in a library as it was never mentioned as an option by his neurologist. After only 4 days on the diet, his seizures stopped and never returned. The Charlie Foundation was born after the kid’s name and his successful recovery, but nowadays the ketogenic diet is available to the entire world and it’s spreading by word of mouth thanks to its healing effects. It is not only used as a healthy lifestyle, it is also used for conditions such as infantile spasms, epilepsy, autism, brain tumors, Alzheimer’s disease, Lou Gehrig’s disease, depression, stroke, head trauma, Parkinson’s disease, migraine, sleep disorders, schizophrenia, anxiety, ADHD, irritability, polycystic ovarian disease, irritable bowel syndrome, gastroesophageal reflux, obesity, cardiovascular disease, acne, type 2 diabetes, tremors, respiratory failure and virtually every neurological problem but also cancer, and conditions were tissues need to recover after a loss of oxygen. The ketogenic diet acts on multiple levels at once, something that no drug has been able to mimic. This is because mitochondria is specifically designed to use fat for energy. When our mitochondria uses fat as an energetic source, its toxic load is decreased, expression of energy producing genes are increased, its energetic output is increased, and the load of inflammatory energetic-end-products is decreased. The key of these miraculous healing effects relies in the fact that fat metabolism and its generation of ketone bodies (beta-hydroxybutyrate and acetoacetate) by the liver can only occur within the mitochondrion, leaving chemicals within the cell but outside the mitochondria readily available to stimulate powerful anti-inflammatory antioxidants. The status of our mitochondria is the ultimate key for optimal health and while it is true that some of us might need extra support in the form of nutritional supplementation to heal these much needed energy factories, the diet still remains the ultimate key for a proper balance. Carbohydrates are not required to obtain energy. Fat supplies more energy than a comparable amount of carbohydrate, and low-carbohydrate diets tend to make your system of producing energy more efficient. Furthermore, many organs prefer fat for energy. I have been doing the low carb diet for about a week and a half now and I must say, I am really starting to feel amazing!!! The first few days my head hurt, I felt lethargic, and my legs felt so heavy. But after I got past that, I have so much energy. I don’t get tired anymore around 3pm. The best part is, I am not constantly thinking and obsessing about food. I feel a real sense of inner calm. My skin looks better, my hair looks better too. I have been having bacon and eggs for breakfast, a pork chop or other piece of meat for lunch, and usually some pork and sometimes some green beans for dinner. I have also lost some weight! Woo hoo!!! -Angela, United States. Sott.net forum. There are many man-made myths surrounding energy production in the body and which foods supply energy. Mainstream science says that carbohydrates are what mitochondria use as fuel for energy production. This process is called oxidative metabolism because oxygen is consumed in the process. The energy produced by mitochondria is stored in a chemical “battery”, a unique molecule called adenosine triphosphate (ATP). Energy-packed ATP can then be transported throughout the cell, releasing energy on demand of specific enzymes. In addition to the fuel they produce, mitochondria also create a by-product related to oxygen called reactive oxygen species (ROS), commonly known as free radicals. But what we are not told is that mitochondria were specifically designed to use fat for energy, not carbohydrate. Source: Christian B. Allan, PhD and Wolfgang Lutz, MD, Life Without Bread.There are several very complicated steps in making ATP within mitochondria, but a look at 5 major parts of ATP production will be all that you need to know in order to understand how energy is created within our mitochondria and why fats are the key to optimize their function. Don’t get focused on specific names, just try to see the whole picture.Step 1 – Transportation of Food-Based Fuel Source into the MitochondriaFuel must first get into the mitochondria where all the action happens. Fuel can come from carbs or it can come from fats. Fatty acids are the chemical name for fat, and medium and large sized fatty acids get into the mitochondria completely intact with the help of L-carnitine. Think of L-carnitine as a subway train that transports fatty acids into the mitochondria. L-carnitine (from the Greek word carnis means meat or flesh) is chiefly found in animal products.Fuel coming from carbs needs to get broken down first outside the mitochondria and the product of this breakdown (pyruvate) is the one who gets transported inside the mitochondria, or it can be used to produce energy in a very inefficient way outside the mitochondria through anaerobic metabolism which produces ATP when oxygen is not present. When pyruvate – the product of breaking down carbs – enters the mitochondria, it first must be converted into acetyl-CoA by an enzymatic reaction. Fatty acids that are already inside the mitochondria are broken down directly into acetyl-CoA in what is called beta-oxidation. Acetyl-CoA is the starting point of the next step in the production of ATP inside the mitochondria. The Krebs cycle (AKA tricarboxylic acid cycle or citric acid cycle) is the one that oxidizes the acetyl-CoA, removing thus electrons from acetyl-CoA and producing carbon dioxide as a by-product in the presence of oxygen inside the mitochondria. The electrons obtained from acetyl-CoA – which ultimately came from carbs or fats – are shuttled through many molecules as part of the electron transport chain inside the mitochondria. Some molecules are proteins, others are cofactors molecules. One of these cofactors is an important substance found mainly in animal foods and it is called coenzyme Q-10. Without it, mitochondrial energy production would be minimal. This is the same coenzyme Q10 that statins drug block producing crippling effects on people’s health. Step 4 is also where water is produced when oxygen accepts the electrons. As electrons travel down the electron transport chain, they cause electrical fluctuations (or chemical gradients) between the inner and outer membrane in the mitochondria. These chemical gradients are the driving forces that produce ATP in what is called oxidative phosphorylation. Then the ATP is transported outside the mitochondria for the cell to use as energy for any of its thousands of biochemical reactions. But why is fat better than carbs? If there were no mitochondria, then fat metabolism for energy would be limited and not very efficient. But nature provided us during our evolution with mitochondria that specifically uses fat for energy. Fat is the fueled that animals use to travel great distances, hunt, work, and play since fat gives more packed-energy ATPs than carbs. Biochemically, it makes sense that if we are higher mammals who have mitochondria, then we need to eat fat. Whereas carb metabolism yields 36 ATP molecules from a glucose molecule, a fat metabolism yields 48 ATP molecules from a fatty acid molecule inside the mitochondria. Fat supplies more energy for the same amount of food compared to carbs. But not only that, the burning of fat by the mitochondria – beta oxidation – produces ketone bodies that stabilizes overexcitation and oxidative stress in the brain related to all its diseases, it also causes epigenetic changes that produce healthy and energetic mitochondria and decreasing the overproduction of damaging and inflammatory free radicals among many other things! Mitochondria regulate cellular suicide, AKA apoptosis, so that old and dysfunctional cells which need to die will do so, leaving space for new ones to come into the scene. But when mitochondria function becomes impaired and send signals that tell normal cells to die, things go wrong. For instance, the destruction of brain cells leads to every single neurodegenerative condition known including Alzheimer’s disease, Parkinson’s disease and so forth. Mitochondrial dysfunction has wide-ranging implications, as the health of the mitochondria intimately affects every single cell, tissue and organ within your body. The catalysts for this destruction is usually uncontrolled free radical production which cause oxidative damage to tissues, fat, proteins, DNA; causing them to rust. This damage, called oxidative stress, is at the basis of oxidized cholesterol, stiff arteries (rusty pipes) and brain damage. Oxidative stress is a key player in dementia as well as autism. We produce our own anti-oxidants to keep a check on free radical production, but these systems are easily overwhelmed by a toxic environment and a high carb diet, in other words, by today’s lifestyle and diet. Mitochondria also have interesting characteristics which differentiate them from all other structural parts of our cells. For instance, they have their own DNA (referred as mtDNA) which is separate from the widely known DNA in the nucleus (referred as n-DNA),. Mitochondrial DNA comes for the most part from the mother line, which is why mitochondria is also considered as your feminine life force. This mtDNA is arranged in a ring configuration and it lacks a protective protein surrounding, leaving its genetic code vulnerable to free radical damage. If you don’t eat enough animal fats, you can’t build a functional mitochondrial membrane which will keep it healthy and prevent them from dying. If you have any kind of inflammation from anywhere in your body, you damage your mitochondria. The loss of function or death of mitochondria is present in pretty much every disease. Dietary and environmental factors lead to oxidative stress and thus to mitochondrial injury as the final common pathway of diseases or illnesses. Autism, ADHD, Parkinson’s, depression, anxiety, bipolar disease, brain aging are all linked with mitochondrial dysfunction from oxidative stress. Mitochondrial dysfunction contributes to congestive heart failure, type 2 diabetes, autoimmune disorders, aging, cancer, and other diseases. Whereas the nDNA provides the information your cells need to code for proteins that control metabolism, repair, and structural integrity of your body, it is the mtDNA which directs the production and utilization of your life energy. A cell can still commit suicide (apoptosis) even when it has no nucleus nor nDNA. Because of their energetic role, the cells of tissues and organs which require more energy to function are richer in mitochondrial numbers. Cells in our brains, muscles, heart, kidney and liver contain thousands of mitochondria, comprising up to 40% of the cell’s mass. According to Prof. Enzo Nisoli, a human adult possesses more than ten million billion mitochondria, making up a full 10% of the total body weight. Each cell contains hundreds of mitochondria and thousands of mtDNA. Since mtDNA is less protected than nDNA because it has no “protein” coating (histones), it is exquisitely vulnerable to injury by destabilizing molecules such as neurotoxic pesticides, herbicides, excitotoxins, heavy metals and volatile chemicals among others. This tips off the balance of free radical production to the extreme which then leads to oxidative stress damaging our mitochondria and its DNA. As a result we get overexcitation of cells and inflammation which is at the root of Parkinson’s disease and other diseases, but also mood problems and behavior problems. Enough energy means a happy and healthy life. It also reflects in our brains with focused and sharp thinking. Lack of energy means mood problems, dementia, and slowed mental function among others. Mitochondria are intricately linked to the ability of the prefrontal cortex –our brain’s captain- to come fully online. Brain cells are loaded in mitochondria that produce the necessary energy to learn and memorize, and fire neurons harmoniously. The sirtuin family of genes works by protecting and improving the health and function of your mitochondria. They are positively influenced by a diet that is non-glycating, i.e. a low carb diet as opposed to a high carb diet which induces mitochondrial dysfunction and formation of reactive oxygen species. Another thing that contributes to mitochondrial dysfunction is latent viral infection such as the ones of the herpes family. As I mentioned in On Viral “Junk” DNA, a DNA Enhancing Ketogenic Diet, and Cometary Kicks, most, if not all of your “junk” DNA has viral-like properties. If a pathogenic virus takes hold of our DNA or RNA, it could lead to disease or cancer. Herpes simplex virus is a widespread human pathogen and it goes right after our mitochondrial DNA. Herpes simplex virus establishes its latency in sensory neurons, a type of cell that is highly sensitive to the pathological effects of mt DNA damage. A latent viral infection might be driving the brain cell loss in neurodegenerative diseases such as Alzheimer’s disease. As I speculated in Heart attacks, CFS, herpes virus infection and the vagus nerve , a latent herpes virus infection might drive more diseases than we would like to admit. Members of the herpes virus family (i.e. cytomegalovirus and Epstein-Barr virus which most people have as latent infections! ), can go after our mitochondrial DNA, causing neurodegenerative diseases by mitochondrial dysfunction. But a ketogenic diet is the one thing that would help stabilize mtDNA since mitochondria runs the best on fat fuel. As it happens, Alzheimer’s disease is the one condition where a ketogenic diet has its most potential healing effect. The role of mitochondrial dysfunction in our “modern” age maladies is a staggering one. Optimal energetic sources are essential if we are to heal from chronic ailments. It is our mitochondria which lies at the interface between the fuel from foods that come from our environment and our bodies’ energy demands. And it is a metabolism based on fat fuel, a ketone metabolism, the one which signals epigenetic changes that maximizes energetic output within our mitochondria and help us heal. I recently had my annual blood work done (cholesterol, etc.) During the review, my doctor said that everything looked great! He then encouraged me to continue on my great ‘low fat, high fruit and veggie diet’ that I must be following! I just smiled. Next visit I’m going to tell him about my real ‘diet’. Lol -1984, United States. Sott.net forum. Ketosis also cleans our cells from proteins that act like “debris” and which contribute to aging by disrupting a proper functioning of the cell. It basically does this by what is known as autophagy which preserves the health of cells and tissues by replacing outdated and damaged cellular components with fresh ones. This prevents degenerative diseases, aging, cancer, and protects you against microbial infections.A ketogenic diet not only rejuvenates you, it also makes a person much less susceptible to viruses and bacterial infections. This is very relevant due to the increasing number of weird viral and bacterial infections that seem to be incoming from our upper atmosphere (for more information see New Light on the Black Death: The Viral and Cosmic Connection), or due to high levels of radiation that creates more pathogenic strains (see Detoxify or Die: Natural Radiation Protection Therapies for Coping With the Fallout of the Fukushima Nuclear Meltdown). Either or, we are more vulnerable than ever due to the state of our mitochondria. But we can prepare for the worst with ketosis. Ketone bodies production through intermittent fasting and the ketogenic diet is the most promising treatment for mitochondrial dysfunction. The longevity benefits seen caloric restriction research is due to the fact that our bodies shift to a fat burning metabolism within our mitochondria. With a ketogenic diet, we go into a fat burning metabolism without restricting our caloric intake. Mitochondria from the hippocampus of ketogenic diet-fed animals are also resistant to mtDNA damage and are much less likely to commit cell suicide –apoptosis- at inappropriate times. Keto-adaptation results in marked changes in how we construct and maintain optimum membrane (“mem-brain”) composition, not only because of the healthy fats we provide through the diet, but also because of less free radical production and inflammatory mediators, along with more production of anti-oxidants. It is really the ideal balanced state. There are two key advantages to having ketone bodies as the main alternative fuel to glucose for the human brain. First, humans normally have significant body fat stores, so there is an abundant supply of fatty acids to make ketones. Second, using ketones to meet part of the brain’s energy requirement when food availability is intermittent frees up some glucose for other uses and greatly reduces both the risk of detrimental muscle breakdown during glucose synthesis, as well as compromised function of other cells dependent on glucose, that is, red blood cells. One interesting attribute of ketone uptake by the brain is that it is four to five times faster in newborns and infants than in adults. Hence, in a sense, the efficient use of ketones by the infant brain means that it arguably has a better fuel reserve than the adult brain. Although the role of ketones as a fuel reserve is important, in infants, they are more than just a reserve brain fuel – they are also the main substrate for brain lipid synthesis. I have hypothesized that evolution of a greater capacity to make ketones coevolved with human brain expansion. This increasing capacity was directly linked to evolving fatty acid reserves in body fat stores during fetal and neonatal development. To both expand brain size and increase its sophistication so remarkably would have required a reliable and copious energy supply for a very long period of time, probably at least a million, if not two million, years. Initially, and up to a point, the energy needs of a somewhat larger hominin brain could be met by glucose and short – term glucose reserves such as glycogen and glucose synthesis from amino acids. As hominins slowly began to evolve larger brains after having acquired a more secure and abundant food supply, further brain expansion would have depended on evolving significant fat stores and having reliable and rapid access to the fuel in those fat stores. Fat stores were necessary but were still not sufficient without a coincident increase in the capacity for ketogenesis. This unique combination of outstanding fuel store in body fat as well as rapid and abundant availability of ketones as a brain fuel that could seamlessly replace glucose was the key fuel reserve for expanding the hominin brain, a reserve that was apparently not available to other land – based mammals, including nonhuman primates. It is indisputable that a ketogenic diet has protective effects in our brains. With all the evidence of its efficacy in mitochondrial dysfunction, it can be applied for all of us living in a highly stressful and toxic environment. Ketone bodies are healing bodies that helped us evolve and nowadays our mitochondria are always busted in some way or another since the odds in this toxic world are against us. Obviously, there are going to be people with such damaged mtDNA or with mutations they were born with, who can’t modify their systems (i.e. defects on L-carnitine metabolism), but even in some of those cases, they can halt or slow down further damage. Our healthy ancestors never had to deal with the levels of toxicity that we live nowadays and nevertheless, they ate optimally. Considering our current time and environment, the least we can do is eat optimally for our physiology. A research member of sott.net’s forum has diabetes type 1 and is doing the ketogenic diet. On normal circumstances, diabetics (including type I) report amazing results on a low-carbohydrate diet. See Dr. Bernstein’s Diabetics Solution by Richard K. Bernstein, MD (Little, Brown and Company: 2007). Porcellini E, Carbone I, et al. Alzheimer’s disease gene signature says: beware of brain viral infections. Immun Ageing. 2010 Dec 14;7:16. Maalouf M, Rho JM, Mattson MP. 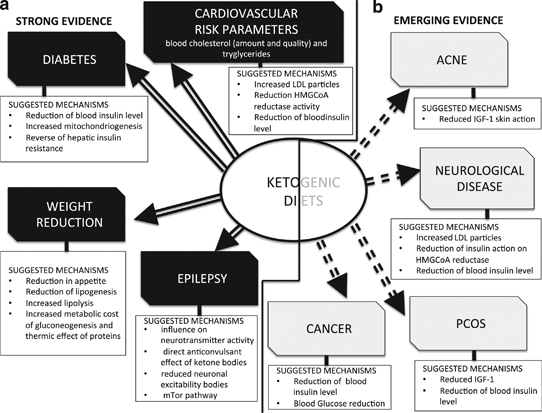 The neuroprotective properties of calorie restriction, the ketogenic diet, and ketone bodies. Brain Res Rev. 2009 Mar;59(2):293-315. Nylen K, Velazquez JL. The effects of a ketogenic diet on ATP concentrations and the number of hippocampal mitochondria in Aldh5a1(-/-) mice. Biochim Biophys Acta. 2009 Mar;1790(3):208-12. Bough K. Energy metabolism as part of the anticonvulsant mechanism of the ketogenic diet. Epilepsia. 2008 Nov;49 Suppl 8:91-3. Finn PF, Dice JF. Ketone bodies stimulate chaperone-mediated autophagy. J Biol Chem. 2005 Jul 8;280(27):25864-70. Yuk JM, Yoshimori T, Jo EK. Autophagy and bacterial infectious diseases. Exp Mol Med. 2012 Feb 29;44(2):99-108. Chandra Wickramasinghe, Milton Wainwright & Jayant Narlika. SARS – a clue to its origins? The Lancet, vol. 361, May 23, 2003, pp 1832. Yordy B, Iwasaki A. Autophagy in the control and pathogenesis of viral infection. Curr Opin Virol. 2011 Sep;1(3):196-203. Douglas C. Wallace, Weiwei Fan, and Vincent Procaccio. Mitochondrial Energetics and Therapeutics Annu Rev Pathol. 2010; 5: 297–348. Stephen Cunnane, Kathlyn Stewart.Human Brain Evolution: The Influence of Freshwater and Marine Food Resources. June 2010, Wiley-Blackwell.